Companies with awesome customer support are ruling the respective industries especially when it comes to online services like website hosting, online applications, and web applications. People normally don’t have time to wait for hours to get the answer to their questions. The best solution to provide answers to the questions asked by your customers is creating an online database of frequently asked questions and their answers in the form of a knowledge base. By doing so your customers will be able to get answers to their technical and pre-sales questions and their satisfaction with your product or services will surge. To create an unmatched support forum for your customers there are many knowledge base WordPress themes out there on the market. 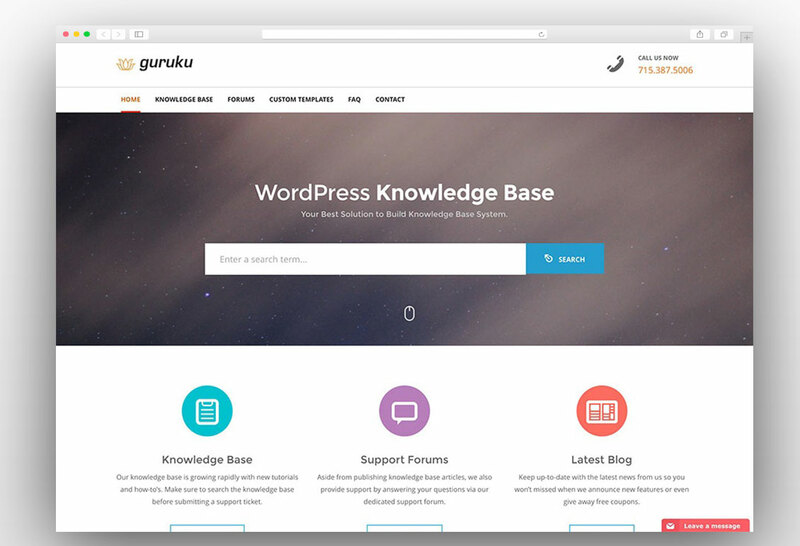 We have compiled a collection of best knowledge base WordPress themes that you can use to create a unique support forum for your customers and take an edge over your competitors. 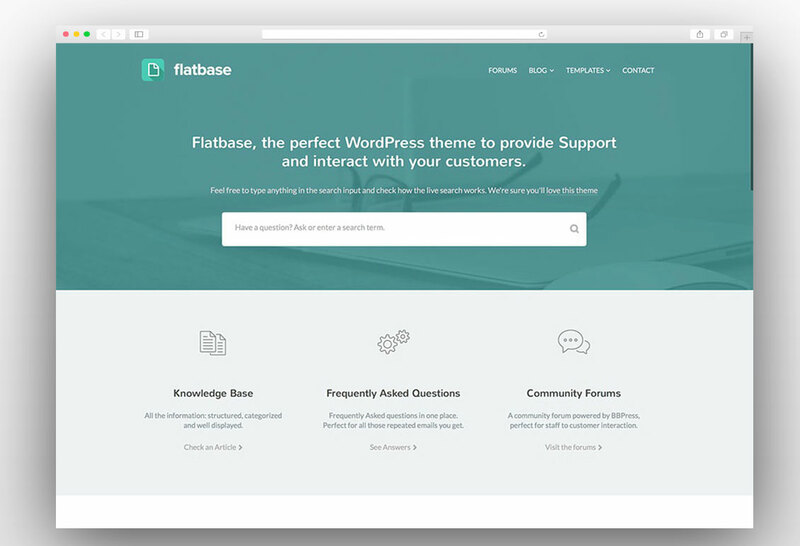 Flatbase is an amazing WordPress theme to provide your customers an unmatched support and answer their questions related to products or services you offer to them. Flatbase has a clean and attractive design which is fully responsive and retina ready. Uncode is one of the best multi-purpose WordPress themes available in the market. It’s clean design and compatibility with third-party plugins make it one of the best choices for developers to develop any kind of the website. 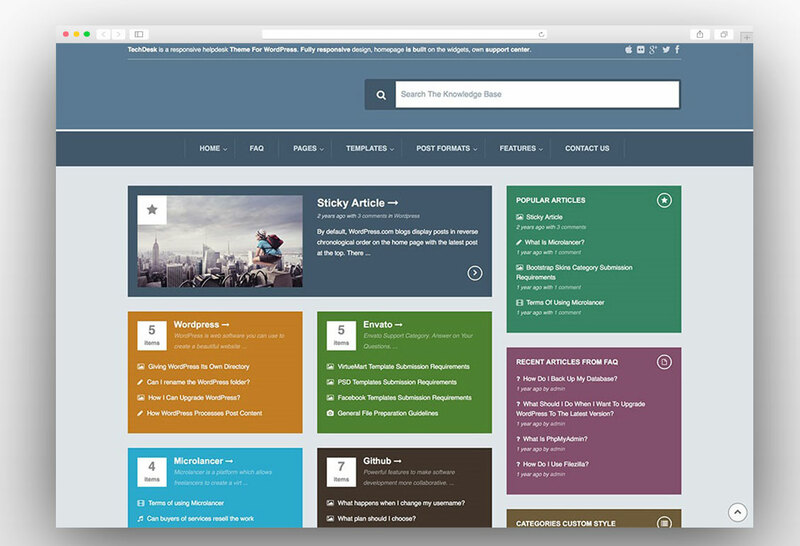 The theme has a number of pre-made layouts and knowledge base is one of the themes. You can easily create an awesome support forum with Uncode WordPress theme. 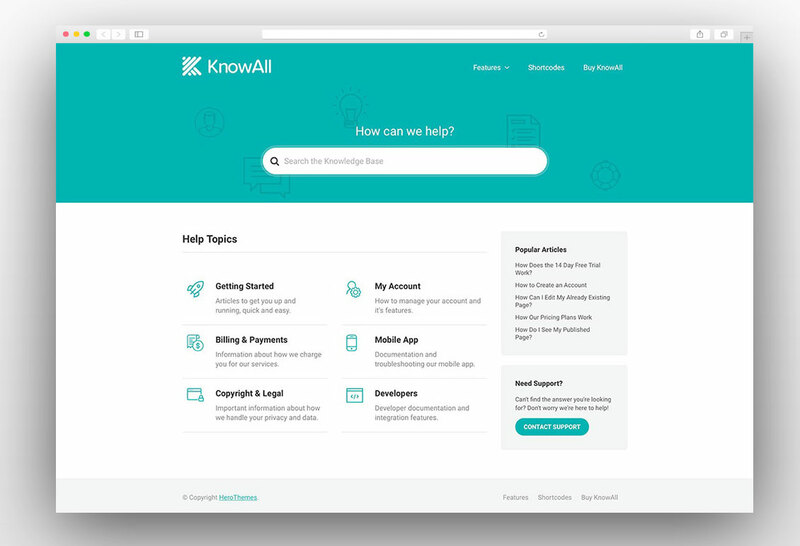 KnowAll is one of the best knowledge base and support theme out there and it leading the race of knowledge base themes in many ways. The clean the responsive design of this theme is giving cutting-edge performance across all the browsers and looks stunning on devices of all sizes. The questions and answer have a quick feedback whether the answer helped the reader or not. 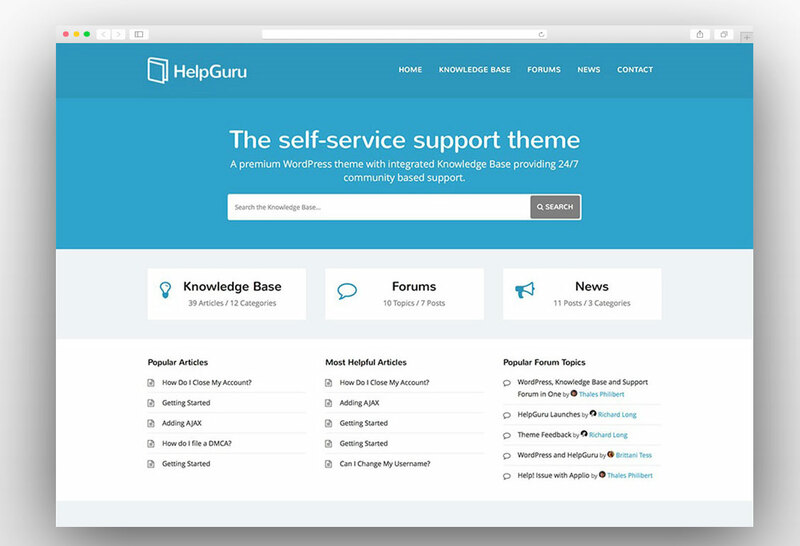 Helper is a very simple knowledge base WordPress theme and it comes with a very easy to understand and simple user interface. 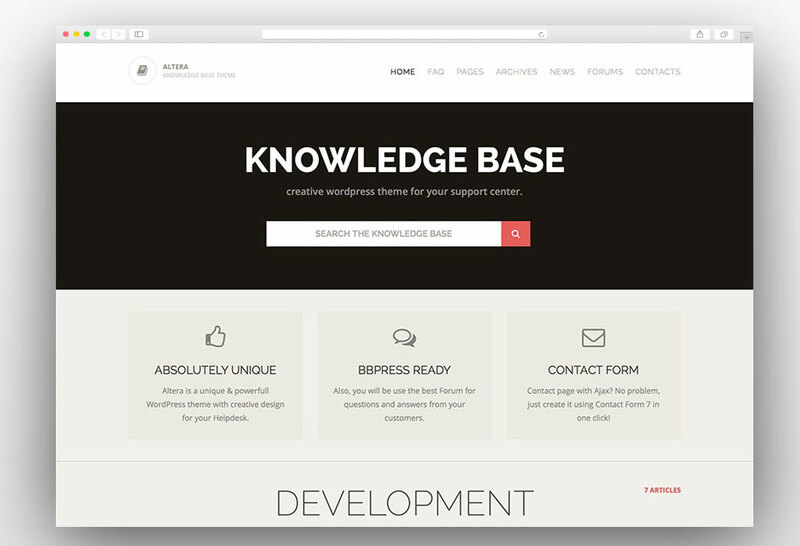 You can create an amazing and easy to use knowledge base website using Helper WordPress theme. The theme comes with visual composer and you can easily build custom layouts using this drag and drop plugin. The theme is powered by a powerful Redux Framework options panel and there is a large number of customization options that you can easily control from the options panel. The theme is fully responsive and it looks stunning in all screen sizes. The Helper WordPress theme is translation ready and it comes with unlimited color options. 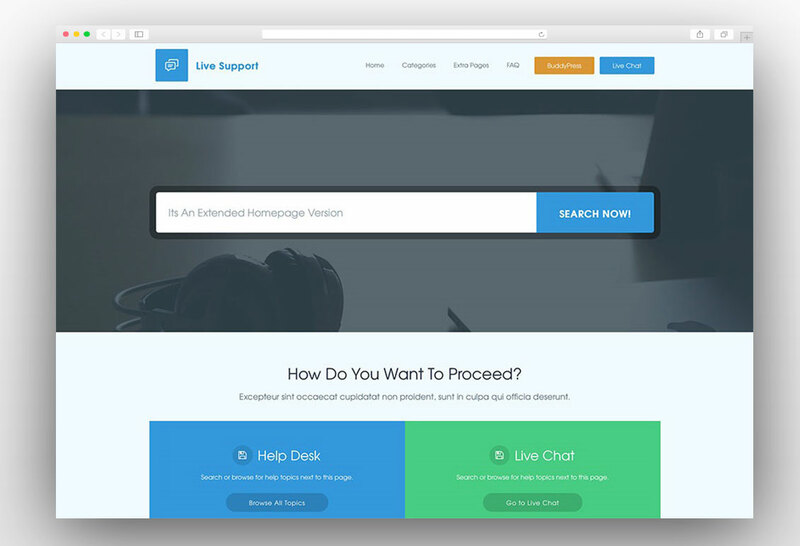 As the name describes Live Support WordPress theme is specially built for providing the live chat support and creating a knowledge base for customer support. The theme is not only limited to creating a live support forum or knowledge base but also it is fully capable of creating regular websites like business websites and blogs. 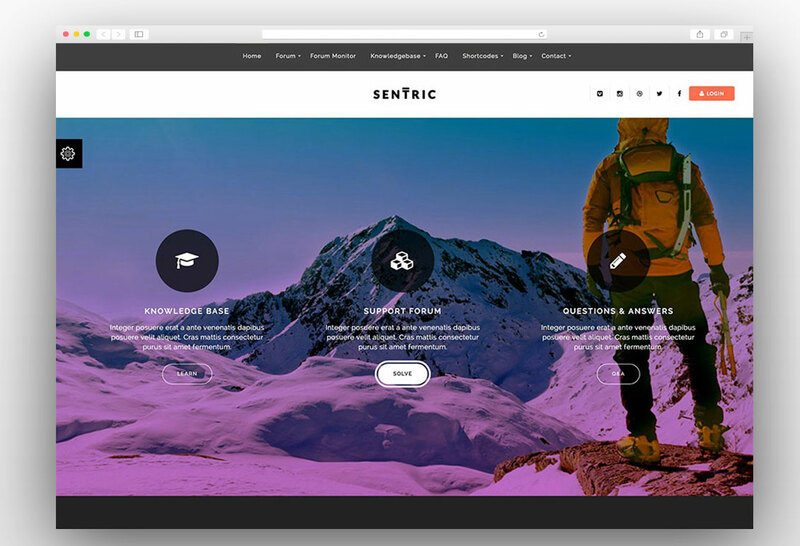 The theme comes with four ready-made homepage layouts and you can choose the one that best meets your needs. The theme is fully responsive and it is made with Twitter Bootstrap. The WPML compatibility allows you to provide support in multiple languages. Live support WordPress theme fully supports BuddyPress. 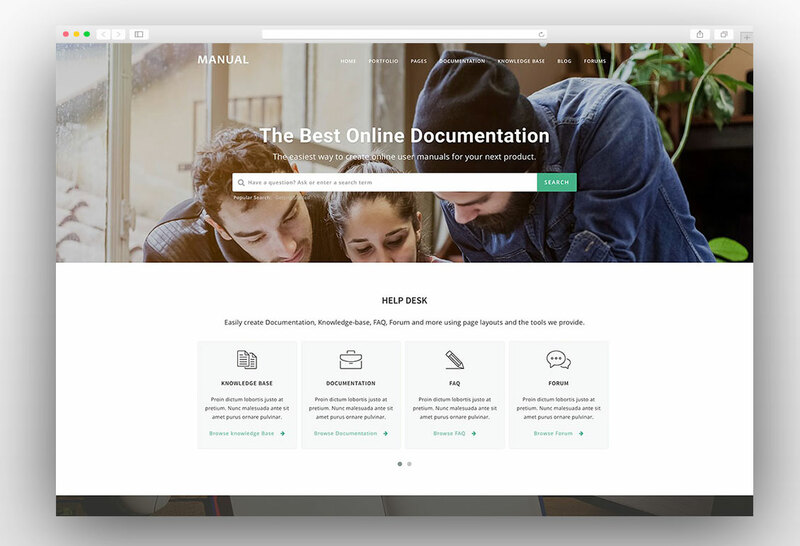 Manual is a powerful Multipurpose help desk WordPress theme to create a support forum for providing better customer support. This theme goes beyond the support forum and it is not limited to the knowledge base website. There are multiple homepage layouts and multiple help desk layouts providing a wide range of options to choose from. There are multiple layouts for the portfolio and theme fully supports Woo Commerce. The fully responsive and retina ready layout makes it look amazing on all screen sizes. The Manual WordPress theme is powered by the visual composer and the revolution slider plugins to create the layout of your own choice. You can create support forum in multiple languages as the theme supports RTL languages. There is an option of attachments in the support forum and users can attach multiple attachments to get a better solution for their problems. The rich admin panel allows you to customize the complete website from a single dashboard. 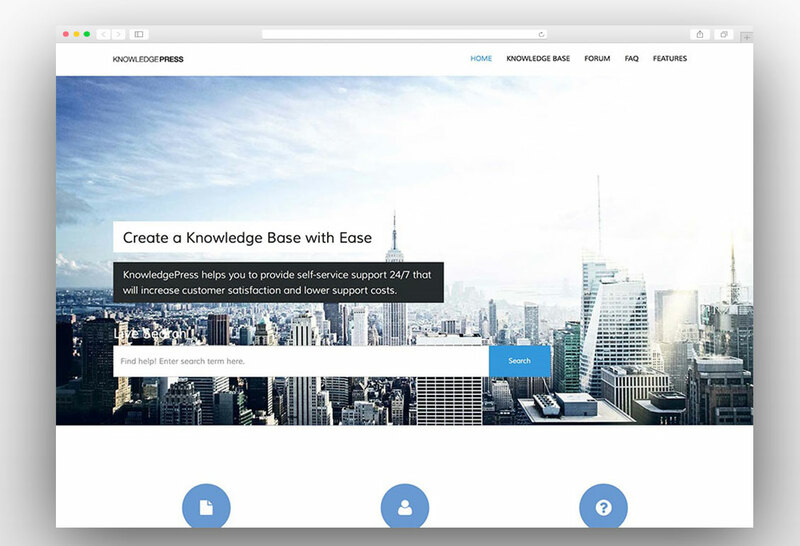 Support Desk is fantastic looking customer support and knowledge base WordPress theme. It’s elegant and unique design makes it very recognizable theme for help desk websites. 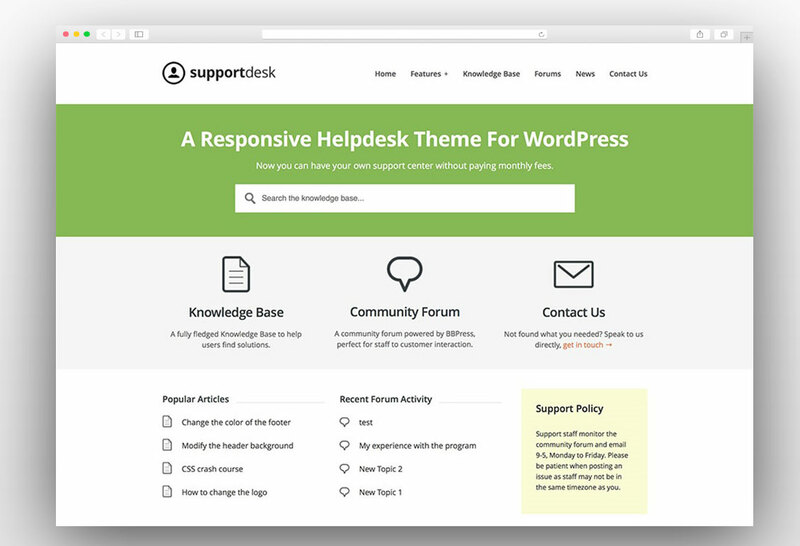 It is super easy to manage and provide support to the customers using this stunning Support Desk WordPress theme. The theme is fully responsive and it looks amazing on all devices of the modern era. 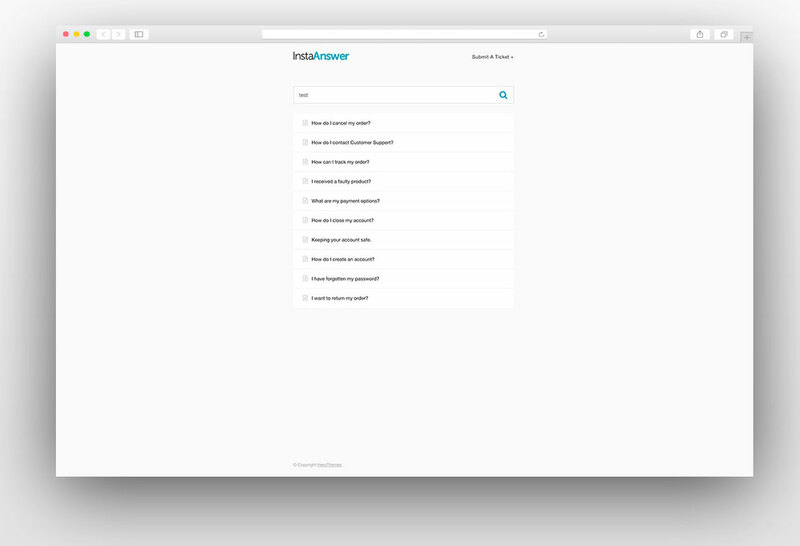 The website provides the instant answer in the live search bar. When the visitor starts typing something the support forum starts giving the suggestions related the search terms. The FAQ section has been included in the theme to cover the frequently asked questions and provide quick solutions to the customers. The theme is SEO ready and translation ready so that you can cover the customers from all over the world for providing matchless support. QA Engine is the simple and elegant WordPress theme to create a highly engaging community and provide quick support to the customers. 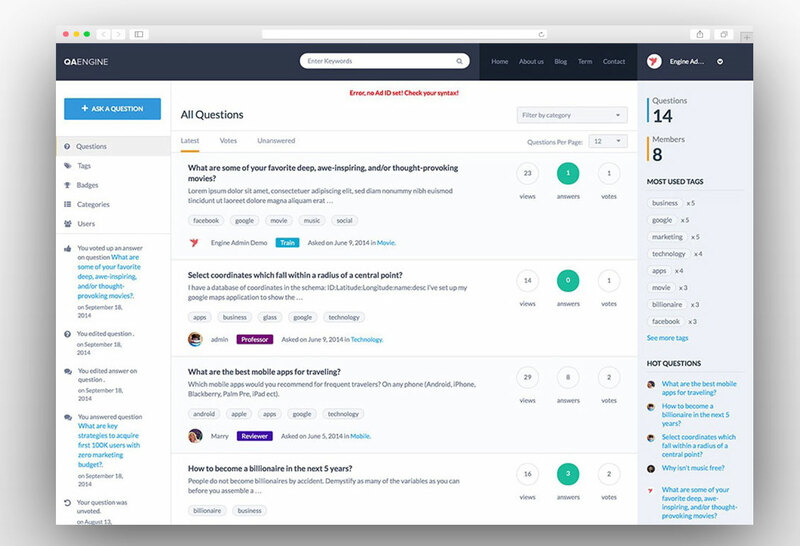 The users can quickly create questions using the simple steps and other users can provide solutions and contribute the community. A user can easily get answers by searching a specific category or by using the FAQ section of the website. There is a powerful monetization option for the website owners as they can sell the memberships and the users can get more answers or answers from the industry experts by upgrading to the premium membership. There are different badges available for different contribution levels for the users. There is best answer check mark and the best answers will be shown at the top of all the answers. 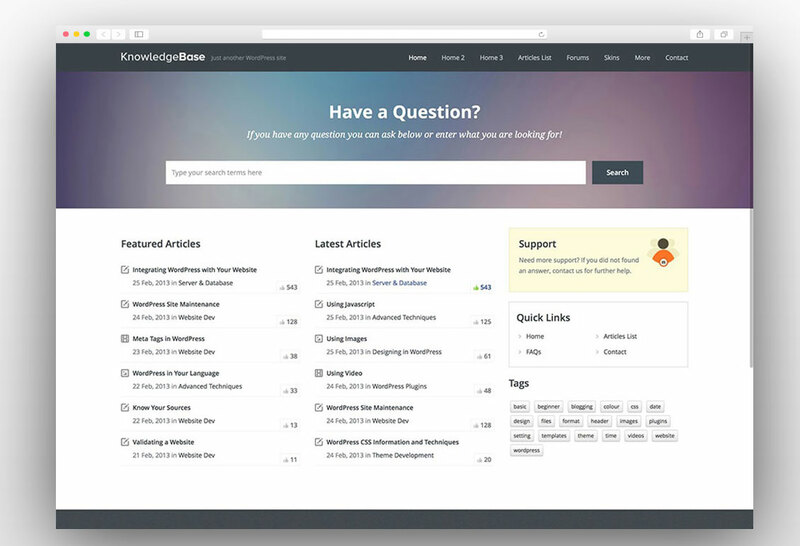 The QA Engine is fully responsive WordPress knowledge base theme. InstaAnswer is the best WordPress theme for creating an FAQ section on the website or a complete website as a knowledge base website. This theme will provide a comprehensive knowledge to your customers which will reduce the customer inquiries. Getting full presale and post-sale support is one of the main concerns of the customers while making a purchase decision. The detailed documentation about your product will increase your sales and also bring the satisfaction to your existing customers. The theme features the lightning-fast live search box which provides instant suggestions. The theme has a friendly admin panel for customizations and it is fully translation ready. 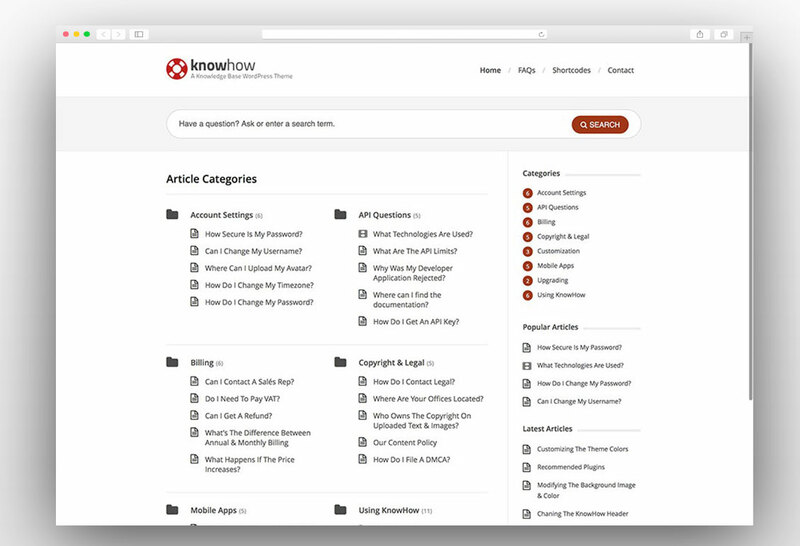 Knowledge Base is a specially designed WordPress theme for the knowledge base and wiki websites. The modern layout makes is one of the best support themes available. The theme is fully responsive and provides a wonderful user experience on all screen sizes. The clean code and well-structured content layout make it super friendly with the search engines. It also supports the bbPress so that you can turn your knowledge base website into a fully functional support forum. An impressive AJAX based live search provides instant results to the users when they are searching something on the website. The theme comes with easy and extensive admin panel to manage and customize the website. 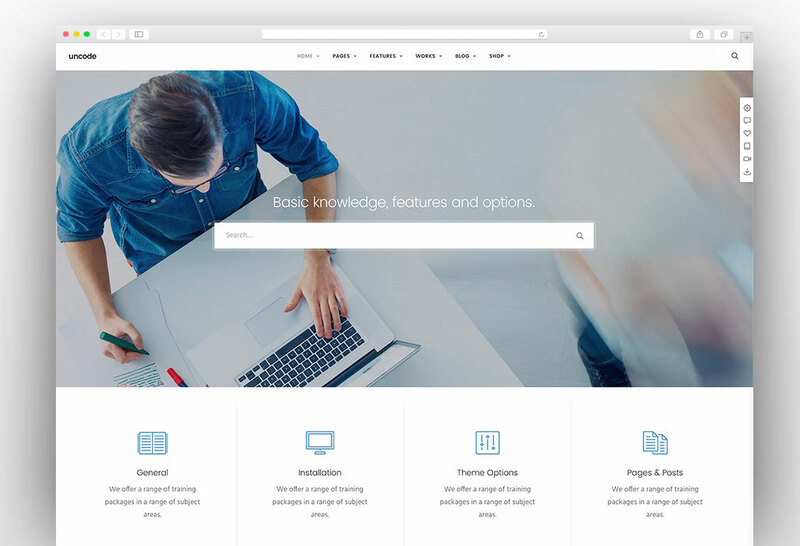 Altera is a clean WordPress theme made for help desk, FAQ and knowledge base websites. The theme has a number of features including live search, widget areas, multiple post formats, multiple faq formats and bbPress integration. The admin panel provides tons of options to manage and customize the website without changing a single line of the code. The theme is fully responsive and retina ready and you can also add unlimited backgrounds of your own choice. It is an SEO ready theme with built-in Schema microdata. You can create the website in any language and the theme fully supports the RTL languages.